...AO Smith Pump Motors & Agriculture Solar Generators Powered Water Energy Increases Efficiency, Lowers Costs and Maintenance. We offer tailor-made solutions that work with you to create energy cost savings. AO Smith Pump Motors and Agriculture Solar generators are dedicated to finding energy-efficient solutions for our customers and business partners. For nearly 75 years, AO Smith Motors has strived to provide customers with the best value and reliability in industrial electric motors. That dedication shows in customer preference for AO Smith pump motors. If your pump motor needs call for water systems farm rated industrial motors, there is a AO Smith motor and Agriculture Solar generator product solution available. While offering advantages of greater control and energy savings to commercial and industrial pump motor users, we can also prevent premature failure in pump systems not designed specifically for heavy duty use in the field. 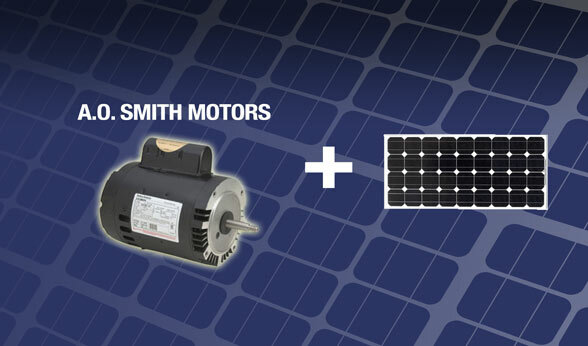 AO Smith Motors and Agriculture Solar together build a pump motor system able to withstand voltage peaks 3.5 times what is stated on the motor nameplate. Therefore we design additional insulation and strategically locate this added insulation in a manner that will yield the necessary protection against the high voltage pulses that may occur between magnet wire strands. This approach yields the desired design integrity. At Agriculture Solar, AO Smith Pumps and Agriculture Energies can be your simple water pump solution for off the grid. Agriculture Energies systems have been dedicated to modern agricultural irrigation and successfully active in the top irrigation fields for over 10 years and continues to bring the tried and true principles and advantages of solar hybrid power. Think about it, and then make your move. Let AO Smith Pump Motors and Agriculture Solar water management provide you with decades of reliability and lasting value. We invite you to explore the possibilities of our reliable hybrid solar powered pump solutions.